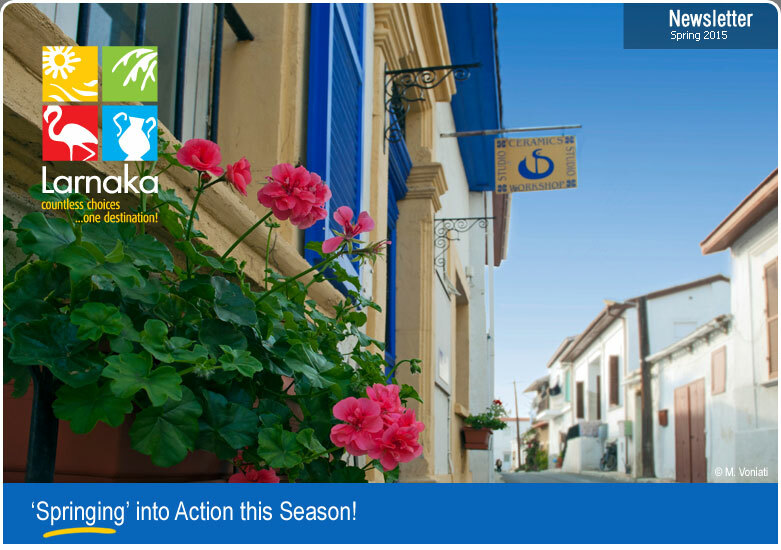 The region of Larnaka is currently in full bloom and dressed in its spring best for this colourful season of renewal! With such favourable and comfortable temperatures, there is no better way to explore and discover the region’s flora and fauna than with a walk along one of the wonderful trails - either within the city or further afield. Or you could take a leisurely stroll along the popular promenade of Foinikoudes, which unveils its new and improved look. When it comes to festivities, Greek Orthodox Easter is the main event of this season, with a host of traditional customs you can observe as a visitor, as well as delicious baked goods. The second Donkey Festival will also take place in May, and there are plenty of professional sporting events to enjoy too. Get your dairies ready to jot down some advance dates for the summer months as well, such as the second Zenobia Festival - which was a great success last year. And if all that walking makes you hungry, why not try something new and tasty? The traditional 'koupa' snack has its roots in Larnaka... and it is perfect for eating on the go as you continue discovering all that the region offers this spring! A host of new and different style hotels are getting ready to open their doors to guests of the Larnaka region! April will see the opening of Mikes Kanarium, and in May, the Ciao Stelio Deluxe Hotel in Mckenzie and the Lokal Hotel in the area of St. Lazarus will open their doors. In July, the main shopping street of Zenon Kitieos will welcome the Josephine Hotel and in the same month, the village of Kato Drys will operate a hotel for nature lovers. Following the extensive upgrade of the Piale Pasha sea road, the popular and distinctive promenade of Foinikoudes has also been 'spruced up for spring'! The fresh new facelift is well underway, with some of the improvements fully completed and others continuing through the season. The strip will keep its unique identity, but will be enhanced by subtle, aesthetic - yet practical - improvements, all ready to welcome the warmer spring and summer months in! Greek Orthodox Easter Sunday falls on April 12 this year and even if you do not celebrate Easter, with such a special feel in the air and a host of interesting customs, it is a lovely time of year to be visiting the region. After all, no one can resist the delicious, freshly baked goods such as 'flaounes' and 'tsoureki', which are readily available during this period. The villages of the Larnaka region will hold game events, which are free for all to participate in. When it comes to athletics, Larnaka is certainly a 'winning' destination that receives much praise for the world-class events it hosts, and 2015 is no exception as we look ahead to a super season of sport! Main tournaments include ISSF World Cup Shotgun, ITF Seniors Tennis Tournament, Larnaka Triathlon, three ITF Beach Tennis Tournaments, the 10th European Universities Beach Volleyball and the International Muay Thai Championship. The humble donkey has played a significant role in the history of daily life on the island, and our furry friends will be honoured again this year on May 9 & 10. The Donkey Festival at the Golden Donkeys Farm in Skarinou offers a mix of children’s activities, stalls of homemade Cypriot food, product tastings, demonstrations of traditional professions and donkey-related attractions and activities including, of course, the opportunity to take a donkey ride! Larnaka’s most famous shipwreck - the Zenobia - will once again be celebrated in June with the 2nd Zenobia Event. The programme will showcase the wreck of the Swedish roll-on-roll-off ferry and its underwater wealth from June 23-30 with a packed programme. Included in the festivities are a mixture of leisure activities, informative events, and contests that will highlight why the wreck ranks as one of the top 10 in the whole world! Walking in Larnaka during spring is like walking through 'a carpet of colour and a bouquet of perfume' as the region unfolds in a rainbow palette not seen at any other time of year! If you enjoy a good walk, then you are spoiled for choice between the many nature trails in mountainous areas, and the city walks that combine nature with culture, and we list a few of our super spring selections here. Larnaka is proud of its status as the oldest inhabited town on the island, and there are new discoveries about the ancient city of Kition made all the time. Most recently, the French Archaeological Mission uncovered new treasures of the ancient city of Kítion and its necropolis. Director of the Mission Dr Sabine Fourrier explained that at the site of Bamboula, excavations revealed the presence of a Phoenician sanctuary and a military harbour. There are many delicious snacks of the island but one of the locally-loved snacks is the 'koupa'. What makes koupa even more special, is that its introduction to Cyprus was in Larnaka! Alexis Michaelides, a historical researcher, has uncovered the ancient origins of the koupa and traced it all the way back to Larnaka during Phoenician times. A koupa is a handheld snack with a crust made of bulgur wheat, stuffed with mince, onions, parsley and spices. Copyright © 2015 Larnaka. All rights reserved.